The Cairns Airport is located between Cairns City and the Northern Beaches and is only a 10 minute maximum drive from the city centre. The Cairns Airport has a Domestic and International Terminal. Shopping and Dining outlets are available. The Cairns Airport is a 25 minute drive South of Trinity Beach and a 35 minute drive South of Palm Cove. Allow an hour when travelling between Port Douglas and the Cairns Airport. If you are travelling in an airport shuttle bus it will take a lot longer due to the pick-ups and drop-offs along the way. If you are travelling with 2 or more people into Cairns City it is more cost effective and convenient to take a taxi. A taxi fare costs around $20 and taxi's meet all flights. Maxi Taxi's are also available. Maxis will take up to 9 passengers. Taxis are available for accommodation transfers and are readily available at both the International and Domestic terminals. Over 3 million passengers pass through Cairns Airport's Domestic Terminal. There are direct domestic flights to Brisbane, Adelaide, Gold Coast, Sydney, Melbourne, Perth, Darwin and Townsville as well as to Alice Springs and Ayers Rock (Uluru) and regional centres. Cairns Airport is Australia's seventh busiest in terms of international passengers with direct flights from Auckland, Tokyo, Osaka, Hong Kong, Guam, Shanghai, Port Moresby and to Singapore, via Darwin. Facilities at both the international and domestic airport include ATM's, Currency Exchange, Car Hire Desks, Post Office, Baggage Storage & Shopping & Dining options. Airport transfers to Port Douglas are available but need to be pre-booked. Send an enquiry with your flight details including flight number, airline and arrival time and we can make these arrangements outside 48 hours notice. Cairns Airport is Australia's leading regional airport, providing air links to a range of domestic and international locations. A major redevelopment of the Domestic terminal was compeleted in 2010 to facilitate these growing passenger numbers. 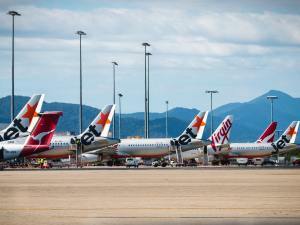 Domestically, Qantas, Jetstar, Tiger Airways and Virgin Blue all operate out of Cairns, which now has scheduled services to all mainland state capital cities as well as various regional locations. Cathay Pacific, Jetstar, Air New Zealand, Continental and Air Nuigini take up the international routes providing access to a variety of international locations from our International terminal.